During his time as a pastor, Rev. 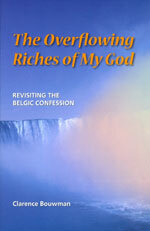 Bouwman has written a number of different books that are both uplifting and insightful. 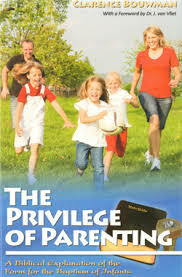 Some of these books are offered here as downloadable PDF’s for your enjoyment. 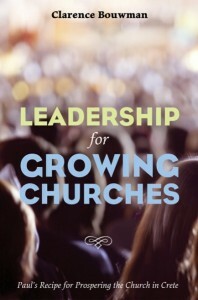 Would a book on how to lead a successful business answer the question of how to grow a church? The Apostle Paul would think not. Taking seriously God’s instruction in the Scriptures Paul had, the apostle instructed Titus what he had to do to grow the church in Crete well–and it was not to follow a business model. For an excerpt of the book, click here. You can order your copy directly from Wipf & Stock, your local bookstore, or by emailing the author here. Rev. 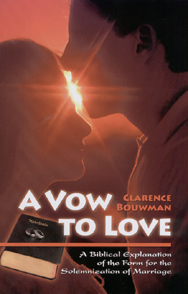 Clarence Bouwman takes us through the Bible to discern what God’s plan for marriage initially was, how the fall into sin has twisted marriage, and how God’s plan has been restored through the work of the Lord Jesus Christ. Rev. Clarence Bouwman draws out that God Himself has formed a bond of love with the children He has entrusted to believing parents, and so these parents receive a most privileged function in God’s kingdom – training the next generation of little ones to know their Father in heaven . The Overflowing Riches of My God. Here are Rev. Bouwman’s notes compiled for a post-confession class on the Belgic Confession. These notes have been in turn been reworked and expanded and published under the title The Overflowing Riches of My God. Here are Rev. Bouwman’s notes compiled for a post-confession class on the Canons of Dort. 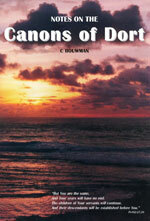 These notes have been published in the current format under the title Notes on the Canons of Dort. Spiritual Order for the Church. Here are Rev. Bouwman’s notes compiled for a post-confession class on the principles and practice of Reformed Church Polity. These notes have been reworked and expanded, and published under the title Spiritual Order for the Church. To purchase these books and other Reformed literature visit the website of the Inter League Publication Board. The Voice of the Church is a media outreach program produced by the Canadian Reformed Churches. The scripture-based meditations are available on the internet and are broadcast on radio stations across North America. The meditations cover a wide range of topics that will introduce you to the life-changing truth of God’s Word. By means of our weekly 15-minute broadcasts we encourage you to become more familiar with the teachings of Holy Scripture and to learn about the plan of salvation only made possible by our Lord and Saviour Jesus Christ. Bible Gateway is your rich social and personal connection to freely read, research, and reference Scripture on your desktop, laptop, tablet, smartphone . . . anywhere; in more than 200 versions and more than 70 languages! Its simple yet advanced searching capabilities allow you to quickly find and compare particular passages in multiple Bible translations based on the keywords, phrases, topics, or Scripture references you have in mind. You’ll be inspired and encouraged – whether reading with your eyes or your ears (audio Bibles) – as you rely on Bible Gateway for all your Bible reading needs.